The ship's location is not far from the Capital itself, about a 20 minute steep walk. An elevator has just been built, to enable passengers an easy ride up to the old town. 1 Euro return. The elevator is about 300 meters from the cruise terminal. To reach the elevator turn right on exiting the cruise terminal, walk along the waterfront road. Just before the road runs under an archway, cross the road to find the entrance to the elevator. There is a nice garden at the upper level. There are plenty of taxis in the port. Webcam of the spectacular harbor entrance. Sailing in to Valetta is probably the highlight of this destination: Welcome to the Middle Ages! So do not sleep late, you do not want to miss this. Malta’s 7,000 years of history means cruise passengers have much to see and do, from megalithic temples dating from around 3,000 BC and thought to be the oldest free-standing structures in the world, to the old city of Mdina, shopping in Valletta, the Grand Master’s palace, or simply people-watching on the waterfront. Stroll the colorful streets of Valletta, taking in sights like the Grandmaster's Palace, the House of Parliament and Castille Palace. The Co-Cathedral of St John is nothing short of a gem and quite simply a must for any tourist. Described as the first complete example of high Baroque anywhere, it epitomises the spiritual and military role of its patrons. Dominating Palace Square, the Grand Master's Palace has always been the house of government in Malta, first by the knights, then the British and now hosts the President's office. When parliament is not in session you can visit the palace for free, and there is an awful lot to see in here. The central area of the old town is pedestrianized, and mostly flat, making for easy walking and good shopping. 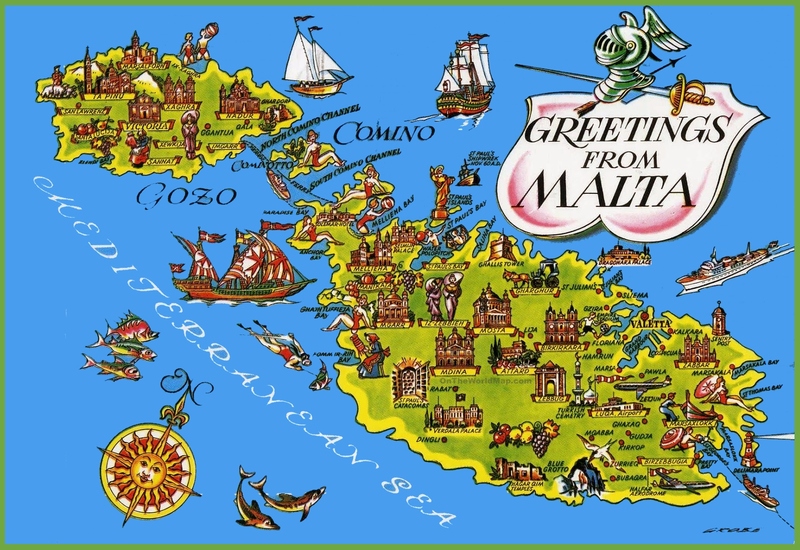 Malta hop on/off tours. Stops right at the cruise terminal. There are two routes - the red route is mostly urban and the blue route mostly countryside. The round trip takes abut 2 hours (red route) and 3 hours (blue route). Taxis and ferries on Malta. Visit Mdina (11km), the island's old capital. It's an impressive walled city dripping in Medieval and Baroque architecture. They call it the Silent City because cars are forbidden. Carriage-laden horses trotting through the streets and the gentle chatter of Mdina's inhabitants are the only sounds likely to pierce the sleepy calm. Crafts have undergone a revival here in recent years. Not solely because they make interesting souvenirs but also because of their high cultural value to the Islands. Some crafts, such as knitwear, basket ware and lace, have a long history. The small cruise terminal has a well stocked duty free store with good bargains in liquor and tobacco products. Wifi can be found in the cafes in Valletta's main street, as well in the restaurants and cafes beside the small cruise terminal. Commercial centers and shops are usually open between 9.00 a.m. and 1.00 p.m. and between 4.00 p.m. and 7 p.m., but a few shops, particularly supermarkets, are open all day. In tourist areas, many shops remain open till 10.00 p.m. Shops are normally closed on Sundays and Public Holidays, however when a cruise ship is in town, they will open their doors.